A much expanded new edition with a design chapter incorporating information on a new technology. A vital element of engineering design. This comprehensive book provides a wide-ranging account of the theoretical aspects of plate and slab theory - in essence structural floors - followed by a discussion of the construction and design of real plate and slab elements. Floor structures account for the majority of all the structural material incorporated into a typical building and plate theories provide the information required to design them. The early chapters discuss kinematics and statics, then the theories of elastic and plastic plates and slabs are developed and studied. The novel methods described are capable of providing 'safe', lower bounds on the collapse loads for a wide range of shapes and types of floor. Then follows a discussion of what criteria should be met by a construction method. These criteria are used to develop design principles for what is termed the 'preferred method of construction'. Worked examples and exercises are provided throughout. The final sections include more lengthy exercises, an extensive, annotated bibliography and some brief historical notes on the evolution of the subject. 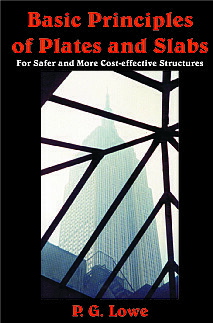 The post '9/11' environment requires that current methods and practices relating to all floor structures, their analysis, design and construction must be critically and impartially re-examined. Preliminaries; Review - the change from one to two dimensions; Statics and kinematics of plate bending ; Elastic plates; Plastic plates (Solid metal plates; Reinforced concrete slabs; Plates and slabs, the comparison method - lower bounds); Optimal plates; Construction and design, a case for new technology; Bibliography and exercises; Appendix: Geometry of surfaces. Civil and structural engineers - to accompany courses in structures, structural mechanics, or strength of materials. The practising engineer will also appreciate the careful and informative discussion of plate theory and the introduction of innovative new material.